SOLIHULL Hospital is fast becoming a place where you don’t want to go with anything approaching an emergency. The cut in maternity services, resulting in births there likely to be reduced by 75 per cent, does little to fill one with confidence in its ability to offer help in a crisis. The plan is another nail in its status as a standalone hospital - it’s death by a thousand cuts. Let’s look at the practicalities here; Solihull has a population of 200,000 and between the borough and Heartlands Hospital lies no end of traffic hold-ups and delays. It seems crazy to blame the move on the requirement for extra medical facilities when you’re making it tougher for the expectant mum to get there to receive them. I’ve no doubt that the midwives who remain in Solihull will be utterly marvellous, but that’s hardly the point. 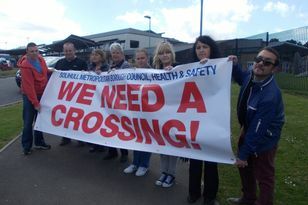 If you want to keep Solihull Hospital as a place which offers a good range of specialities in what is a metropolitan borough, now is the time to shout it out. On another note, who’s bright idea was it to resurface the Warwick Road to and from the M42 on Sunday? It was the day the NEC welcomed thousands of visitors from all over the world for the centennial International Rotarian Convention and there were high hopes that many of them might pop in to Solihull to see what it had to offer. What they would have found was the feeder road to Warwick Road closed, Marsh Lane jammed with traffic, and dust and flying grit everywhere. Welcome indeed.